Vesole (DD-878) was laid down on 3 July 1944 at Orange Tex. by the Consolidated Steel Corp. launched on 29 December 1944; sponsored by Mrs. Kay K. Vesole and commissioned on 23 April 1945 Comdr. H. E. Townsend in command. Following a short visit to Galveston Tex. Vesole got underway on 11 May for Guantanamo Bay Cuba. She completed shakedown training on 10 June and left the West Indies bound for Norfolk Va. The ship arrived at Norfolk on the 12th and began conversion to a radar picket destroyer. The alterations were completed on 29 July and the ship stood out of Chesapeake Bay for additional training along the east coast and in the West Indies. She concluded training on 13 August and set a course for the Panama Canal. While en route she received word of the Japanese capitulation but continued on toward the Pacific Ocean. She transited the canal on 16 August reported for duty with the Pacific Fleet and continued on to San Diego where she arrived on 24 August. On the 28th the destroyer put to sea once again and steamed to Pearl Harbor where she joined aircraft carrier Boxer (CV-21) for the voyage to Japan. During her more than a year in the Far East Vesole conducted numerous training evolutions usually in company with a carrier task group most frequently with Boxer Lexington (CV-16) or Intrepid (CV-11). She ranged the China coast making visits frequently at Tsingtao and Shanghai and also calling at the Japanese ports of Tokyo Kure and Yokosuka. On two occasions during the winter of 1945 and 1946 the warship made round-trip voyages from Japan to the Marianas and back. Later in 1946 she added Okinawa and Hong Kong to her itinerary while continuing to stop at Japanese Chinese and Philippine ports of call. In November of 1946 she departed Tsingtao for the last time and headed home. After a stop at Guam on the 29th and a similarly brief visit to Pearl Harbor she arrived in San Diego on 16 December. On 6 January 1947 the destroyer stood out of San Diego in company with the other units of Destroyer Division (DesDiv) 141 and headed via the Panama Canal back to the east coast. She made a six-day layover at Norfolk from 23 to 29 January and arrived at the New York Naval Shipyard where she began a three-month overhaul. She completed repairs on 30 April and put to sea for sea trials. In June she conducted refresher training. Various exercises out of Newport R.I. occupied her time until 2 September at which time she put to sea bound for European waters. She arrived in Plymouth England on 11 September and spent the next five months visiting such ports as Antwerp Belgium and Lisbon Portugal as well as a number of British ports. She departed Plymouth on 4 February 1948 and headed back to the United States. On St. Valentine's Day 1948 Vesole arrived back in Newport. A short four-month period of normal operations along the east coast ensued. On 5 June the ship once again embarked upon a voyage to western Europe this time with Naval Academy midshipmen embarked and in company with a carrier task force built around Coral Sea ( CV-43) . Conducting all manner of training evolutions along the way Vesole steamed to Lisbon Portugal and thence into the Mediterranean. The task group operated in the Mediterranean until 12 July at which time it headed for Guantanamo Bay Cuba. Following another month of training in the West Indies Vesole disembarked the midshipmen at Annapolis on 24 August and then entered the Boston Naval Shipyard for a two-month overhaul. In November the warship began post-overhaul refresher training first in Narragansett Bay and later in the West Indies. Following five months of normal 2d Fleet operations Vesole departed Newport on 18 April 1949 for another deployment to the Mediterranean Sea. That assignment which consisted primarily of training duty lasted until 17 September when the warship pointed her bow homeward. She reentered Newport on the 25th and resumed operations along the east coast. That employment which included both cold weather and Caribbean duty lasted until 3 May 1950 when she got underway from Norfolk with TG 88.1 to return to the Mediterranean. Over the next five months the destroyer visited a host of ports along the Mediterranean littoral and conducted a number of exercises in cooperation with the fast carriers as well as amphibious training and independent ship's drills. She concluded that tour of duty in the "middle sea" late in September and returned to the United States at Norfolk on 4 October. The ship began a yard overhaul almost immediately and it lasted until 15 February 1951 at which time she began a six-week period of refresher training in the West Indies. The warship returned to Norfolk on 3 April and began preparations for another cruise to the Mediterranean. On 15 May Vesole departed Norfolk to join the 6th Fleet. Once again she conducted a variety of training exercises including a multinational one Operation "Beehive " with units of the British French and Italian navies punctuated by frequent calls at ports throughout the Mediterranean. The destroyer took leave of the Mediterranean at Gibraltar on 23 September and returned to Norfolk on 6 October. Vesole resumed normal 2d Fleet operations once more. These included a major Atlantic Fleet exercise amphibious exercises and a convoy exercise. After a short visit to the New York Naval Shipyard for the installation of new electronic gear she steamed back to Norfolk to prepare for another deployment to the Mediterranean Sea. She departed Norfolk on 21 April 1952 and for the next six months executed the normal 6th Fleet schedule of exercises and port visits. The warship left Lisbon Portugal on 11 October and arrived back in Norfolk on the 20th. For the next five months Vesole underwent extensive alternations at the Norfolk Naval Shipyard. She traded her 40-millimeter antiaircraft battery for six 3-inch 50-caliber rapid fire guns in dual mounts. Her aftermast was removed and a taller mast was installed forward. In addition she received much highly sophisticated radar electronic and communications equipment. She completed the alterations at the end of March 1953 and late in April Put to sea for refresher training in the Guantanamo Bay operating area. At the conclusion of refresher training the destroyer returned to Norfolk arriving there on 14 June. She resumed operations out of Norfolk until sailing once again for the Mediterranean on 16 September 1953. Over the next decade Vesole continued to alternate deployments to the 6th Fleet in the Mediterranean with periods of normal operations along the east coast and in the West Indies. During her 1958 tour of duty Vesole earned the Armed Forces Expeditionary Medal as a unit of the contingency force established in the eastern Mediterranean during the internal crisis in Lebanon. In 1962 she earned that same award as a result of the quarantine placed on Cuba due to the siting of Russian missiles on that island. The destroyer participated actively in that operation patrolling the area between Key West Fla.. and Havana Cuba. She inspected two of the Russian merchant ships charged with removing the missiles from Cuba and visually accounted for 12 of the 42 missiles. Other than for her participation in those two crises the decade between 1953 and 1963 passed routinely with training duty along the east coast Mediterranean deployments overhauls and the like. January of 1964 found her in the Philadelphia Naval Shipyard undergoing a fleet rehabilitation and modernization (FRAM) overhaul to improve her antisubmarine warfare capabilities. The alterations included significant superstructure modifications and internal changes. Living compartments and messes were improved but more importantly she received a drone antisubmarine helicopter (DASH) hangar for later augmentation with the helicopter itself as well as new radar electronic warfare equipment and an antisubmarine rocket (ASROC) launcher. The warship completed her FRAM modifications late in September of 1964 and on 7 October departed Philadelphia for her new home port Newport R.I. her base for operations with the Atlantic Fleet as a unit of the Hunter/Killer Antisubmarine Warfare Group. That duty continued until late in 1965 when she embarked upon her only deployment to the Vietnam war zone. She spent late 1966 and early 1966 engaged in "Market Time" operations off the Vietnamese coast the interdiction of enemy coastwise logistics operations and in gunfire duties supporting the troops fighting ashore. She also served intermittently in the antisubmarine screen of the carriers operating off Vietnam in the Gulf of Tonkin. After upkeep at Subic Bay she got underway with DesRon 24 to return to Newport. Steaming via the Indian Ocean the Suez Canal the Mediterranean Sea and the Atlantic Ocean Vesole arrived back in Newport on 8 April 1966. During the next six years the warship made four deployments overseas: three with the Middle East Force in the Indian Ocean and one with NATO's Standing Naval Force in the eastern Atlantic and in European waters. After seven months of normal east coast duty Vesole departed Newport and headed via the Mediterranean and the Suez Canal to her first tour of duty with the Middle East Force stationed in the Indian Ocean. On 29 December she transited the Suez Canal and relieved Johnston (DD-821) at Port Sudan. That assignment consisted entirely of training evolutions and goodwill visits to East African and Persian Gulf ports. She concluded that tour of duty on 28 February 1967 when she retransited the Suez Canal and reentered the Mediterranean. She crossed the "middle sea" and the Atlantic Ocean and arrived back in Newport on 21 March. Normal operations as far south as Jacksonville Fla. occupied her time for the remainder of the year. During the first two months of 1968 she conducted exercises in the West Indies before returning north for a yard overhaul. The warship entered the Boston Naval Shipyard on 12 April 1968 and remained there until 19 August. Following refresher training in the West Indies in September and October Vesole returned to Newport on 7 November to prepare for her next deployment. On 6 January 1969 the destroyer stood out of Newport bound for the Netherlands and duty with NATO's Standing Naval Force in the Atlantic. She reached Den Helder on 18 January and began her five-month tour of duty. That assignment was made up of a series of multinational fleet exercises and goodwill visits to western European ports. On 17 May following a NATO review in which Queen Elizabeth II of Great Britain participated she concluded her assignment in European waters and headed back to the United States. Vesole returned to the United States at Norfolk on 2 June and reentered her home port Newport almost a month later on 1 July. The warship remained there over six weeks before getting underway on 19 August to proceed to her new home port Charleston S.C.
Vesole operated out of Charleston for the remainder of the year and during the first two months of 1970. On 3 March she left Charleston to deploy for a second time to the Indian Ocean. On this occasion she took the long route around the Cape of Good Hope calling at various African ports along the way. She reported for duty with the Middle East Force at Diego Suarez in the Malagasy Republic during the second week in April. For the next six months the destroyer plied the Indian Ocean conducting exercises alone with other ships of the Middle East Force and with units of foreign navies making port calls along the Indian Ocean littoral. She was finally relieved of that duty at Mombasa Kenya during the second week in August. The destroyer departed Mombasa on 14 August and again taking the Cape of Good Hope route headed back to Charleston where she arrived on 18 September. Vesole operated along the east coast of the United States for just over a year. During that time she participated in tests of the Harpoon missile system and of the Poseidon missile. She planeguarded for aircraft carriers conducting pilot carrier qualifications and participated in a number of exercises. On 23 September 1971 she got underway from Charleston bound ultimately for her last tour of duty with the Middle East Force. After stops at Recife Brazil and several African ports the warship arrived in Majunga in the Malagasy Republic on 29 October to report for duty. Once again goodwill port visits and exercises highlighted her deployment. After only four months in the Indian Ocean she was relieved by Charles P. Cecil (DD-835) at Mombasa during the second week in February 1972. On Lincoln's Birthday 1972 the destroyer began the long voyage home. Again rounding the Cape of Good Hope and crossing the Atlantic she arrived back in Charleston on 11 March 1972. She conducted local operations out of Charleston until 5 July when she entered the Charleston Naval Shipyard for a four-month overhaul. When Vesole emerged from the shipyard in November 1972 she began her last four years as an active ship in the Navy. Those four years brought three more overseas cruises two with the 6th Fleet in the Mediterranean and one to South America for a series of UNITAS exercises with South American navies. Immediately following overhaul the warship conducted sea trials and refresher training which continued until March of 1973. On 19 March she returned to Charleston to begin converting her main propulsion plant to the use of Navy distillate fuel. That conversion was completed on 24 May at which time she returned to sea for trials and then for normal 2d Fleet operations. On 27 July she departed Charleston for UNITAS XIV a series of binational exercises conducted in cooperation with various South American navies. During that deployment she transited the Panama Canal to operate in the Pacific with units of the Peruvian and Chilean navies. The deployment also brought exercises with the navies of Colombia Brazil Uruguay and Argentina. Vesole ended her long UNITAS voyage back at Charleston on 15 December. After the holidays she began 11 months of duty out of Charleston. Gunnery ASROC and torpedo exercises predominated during that time but she also trained with aircraft carriers. On 15 November 1974 she departed Charleston to return to the 6th Fleet in the Mediterranean after a four-year hiatus. That deployment lasted until 5 May 1975 at which time she departed Rota Spain to return to the United States. The ship arrived back in Charleston on 15 May and after an availability alongside tender Sierra (AD-18) she resumed operations at sea out of Charleston. The warship remained so employed until the beginning of 1976 her last year of active service to the Navy. On 6 January 1976 Vesole departed Charleston for her final overseas deployment fittingly enough with the 6th Fleet. She arrived in Rota Spain on 17 January and entered the "middle sea" on the 19th. During that deployment she participated in Exercise "Silver Fox " conducted in the Black Sea and constituted a unit of the contingency force dispatched to the eastern Mediterranean from 3 April to 15 May as a result of internal strife in Lebanon. Vesole concluded that deployment at Charleston on 28 July 1976. 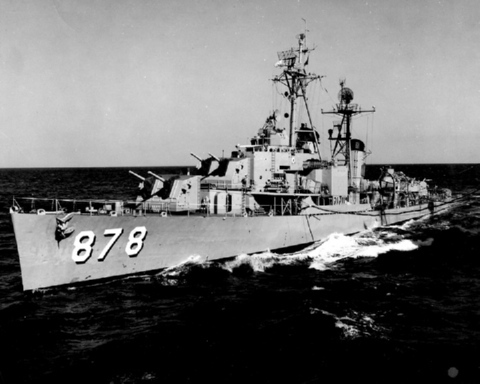 The destroyer was placed out of commission there on 1 December 1976. Her name was struck from the Navy list on that same day and as of January 1980 her transfer to a foreign government was still pending. Vesole earned two battle stars for her service in the Vietnam conflict.